4 Bedroom Terraced House For Sale in Stevenage for Asking Price £330,000. This spacious four bedroom family home with off street parking is offered chain free. Extended to the rear the property has a full width ground floor extension/conservatory perfect for family life and entertaining with French doors leading into the rear garden. The ground floor further comprises of a lounge, modern kitchen and cloakroom. To the first floor there are four bedrooms and a family bathroom. 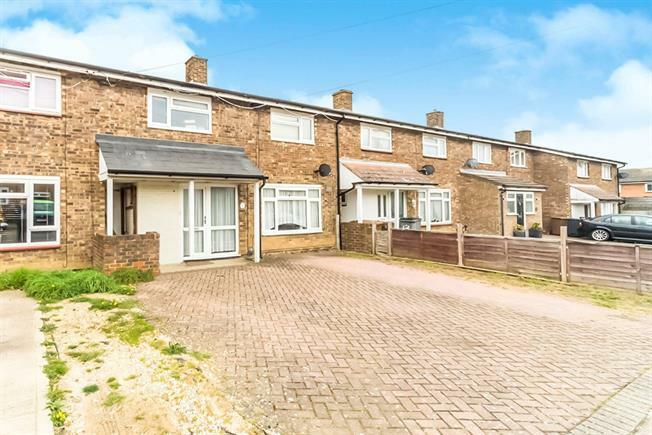 Located in the Shephall area of Stevenage the family home is within easy walking distance to local amenities such as a doctors surgery, shops, schooling and bus route. UPVC front double glazed door, double glazed UPVC window with patterned glass. Laminate flooring, painted plaster ceiling, ceiling light, stairs leading to first floor, doors leading to lounge and cloakroom. Double glazed UPVC window facing the front. Radiator, laminate flooring, painted plaster ceiling and ceiling light. UPVC sliding double glazed door, opening onto the conservatory. Tiled flooring, under stair storage, painted plaster ceiling, ceiling light. Granite effect, roll top work surfaces, fitted and wall and base units, stainless steel sink, integrated oven, integrated hob, integrated dishwasher, space for washing machine, intergrated fridge/freezer. UPVC patio double glazed door, opening onto the patio. Double glazed UPVC window facing the rear overlooking the garden. Radiator, laminate flooring, wall lights. Heated towel rail, tiled flooring, artex ceiling, ceiling light. Double glazed UPVC window facing the front. Radiator, laminate flooring, sliding door wardrobe, painted plaster ceiling, ceiling light. Double glazed UPVC window with patterned glass. Tiled flooring, painted plaster ceiling, ceiling light. Standard WC, panelled bath with mixer tap, shower over bath, pedestal sink with mixer tap.